An analysis of the alignment of the El Cerrito archaeological site, located about 180 km northwest of Mexico City, suggests that it could be 50,000 years old or more. 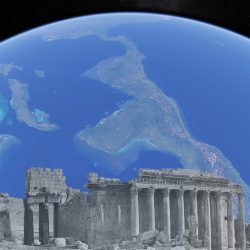 Before Atlantis describes how more than three dozen sites in Mexico and Central America appear to be aligned to previous locations of the North Pole, based on Charles Hapgood’s hypothesis that Earth’s poles have shifted several times over the past 100,000 years. The alignment of a part of modern-day Mexico City, formerly the Aztec capital of Tenochtitlan is rotated about 7° east of north in the direction of one of those ancient poles in northern Greenland (Figure 1). Sites aligned to the Greenland pole could be 50,000 years old or more based on Hapgood’s climate-based dating as described in Before Atlantis. Figure 1 Echos of the past – a part of modern-day Mexico City faces the ancient Greenland pole. More than a century ago, in the process of examining thousands of clay pits over a two thousand square mile area, mineralogist William Niven discovered extensive stratigraphic evidence that a series of catastrophes had occurred in this part of Mexico over a period of tens of thousands of years. The layers or “pavements” in the stratigraphy appear to be correlated to three civilizations punctuated by two catastrophes, the most recent being the shift from the Hudson Bay to the current pole 12,000 to 18,000 years ago. The lowest layer uncovered by Niven appears to correlate to the time when sites such as Tenochtitlan were oriented due north toward an even earlier Greenland pole. I was inspired by a recent post in Megalith Research to examine the pyramid known as El Pueblito in the El Cerrito Archaeological Zone. In examining El Cerrito, located about 180 km northwest of Mexico City, the site appears to be similarly misaligned to the north (Figure 2). Archaeologists believe El Pueblito was built in several stages from around 700 CE until 1250 CE when the area was abandoned. The east side of the pyramid, which has been restored is not a perfectly aligned structure. Near the top, steps are aligned 5 to 6° east of north and 3 to 4° east of north at the bottom. Analyzing the alignment of the pyramid itself is thus problematic. Figure 2 Alignment of El Cerrito archaeological site. The green line points toward the Greenland pole. Figure 3 Vertically exaggerated elevation grid in the previous figure aligns to the south edge of the El Cerrito acropolis. The pyramid is located on a hill whose southern edge along a road is aligned 7.4° south of east, which is at a right angle to the direction of the Greenland pole. Further analysis suggests the three-dimensional structure of the hill is also oriented in that direction (Figure 3) suggesting the possibility that the hill was an even older acropolis on which the pyramid was later built. Figure 4 Perspective view of El Cerrito acropolis aligned in the direction of the ancient Greenland pole. 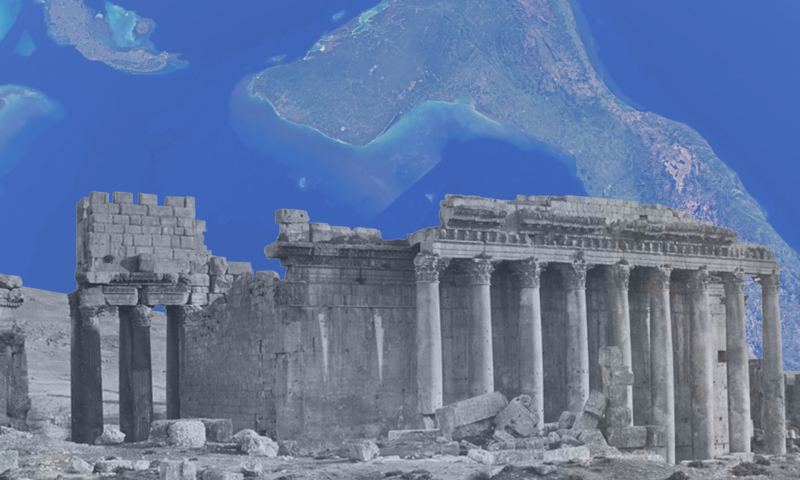 Similar sites in other parts of the world such as the Parthenon atop the Acropolis in Athens and the Temple of Jupiter in Baalbek, Lebanon are described in Before Atlantis. Is it possible that the so-called “first stage” of construction at El Cerrito in 700 CE was over a pre-existing site that had been first established by an even older “lost civilization” who inhabited the Valley of Mexico 50,000 years ago? Thank you for writing about this and helping to bring pole shifts and very ancient civilizations to the world’s attention. The periodic cycle of catastrophic, civilization-ending destruction from POLE SHIFTs may be the single most important truth authorities try to keep hidden from the public.